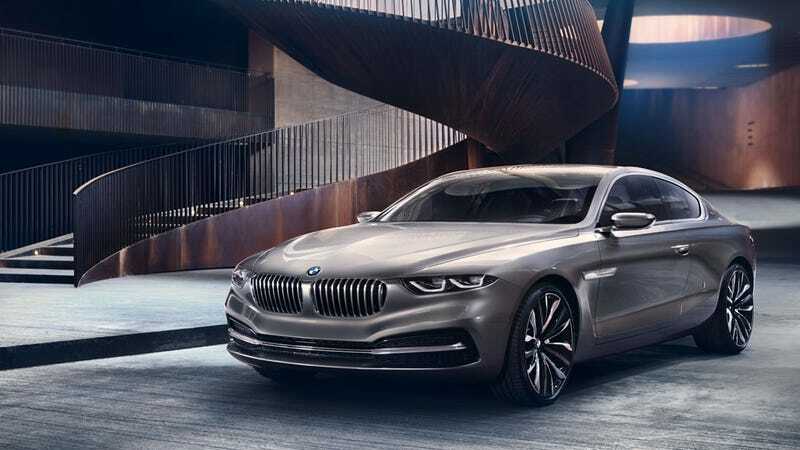 BMW Design and Pininfarina have teamed up to make this striking-looking one-off, the Gran Lusso Coupé. Revealed today at the Concorso D'Eleganza Villa D'Este, the apostrophe-laden fancy car show by Lake Como in Italy, the gran Lusso may hint at future BMW design directions. While it's still clearly a BMW, incorporating the kidneys and kinks peculiar to the marque, it diverges pretty significantly stylistically. The strong forward rake of the front end does suggest the wonderful old sharknose BMWs from the 70s and 80s, though the almost-fastback shape is something not normally associated with BMWs. The roof liner of finest Italian virgin wool features the striking “Principe di Galles” pattern. This grey plaid strikes a bold contrast to the traditional materials used for the doors and dashboard. The brown leather seats also pick up on the pattern in their all-round piping. Allowing extra light into the interior is an oblong aperture in the roof liner which is additionally illuminated by white LEDs. That's right, it's all from one piece of wood hand-selected by some Italian wood-elf on his deathbed or something. Doctors suggest placing your unclothed groin in contact with it to prevent prostate cancer, I believe. It's a handsome, bold looking car, that's for certain. The long wheelbase, wide stance, short overhangs, and lovely sculpturing of the flanks certainly make the over-wrought press release hype more palatable. do make me wonder. "Road-focused" lights? Is there any other location headlights are focused? And "suggested twin circular" is odd, considering the lights aren't circular. Do shapes that aren't circles suggest "circular?" Well, maybe. Octogons, I guess. Still, it's weird.